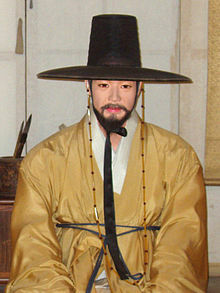 A gat is a type of Korean traditional hat worn by men along with hanbok (Korean traditional clothing) during the Joseon period. It is made from horsehair with a bamboo frame and is partly transparent in black color. Most gat are cylindrical in shape with a wide brim on a bamboo frame. Only noble class men during the late 19th century could wear gat, which represented their social status and protected their topknots (Hangul: 상투; RR: sangtu). Under the Joseon, black gat (Hangul: 흑립; Hanja: 黑笠; RR: heungnip) were restricted to men who had passed the gwageo examination. Commoners wore a variant called paeraengi (패랭이) which was woven from split bamboo. Artisans who make gat are called ganniljang (갓일장) in Korean, from gannil (갓일 "hatmaking, millinery") + jang (Hangul: 장; Hanja: 匠 "artisan, craftsman, master of a craft"). ^ "패랭이". naver.com. Retrieved 2 November 2015. Wikimedia Commons has media related to Gat. (in Korean) "Master Artisan of Horsehair Hat Making"
This page was last edited on 16 March 2019, at 07:40 (UTC).